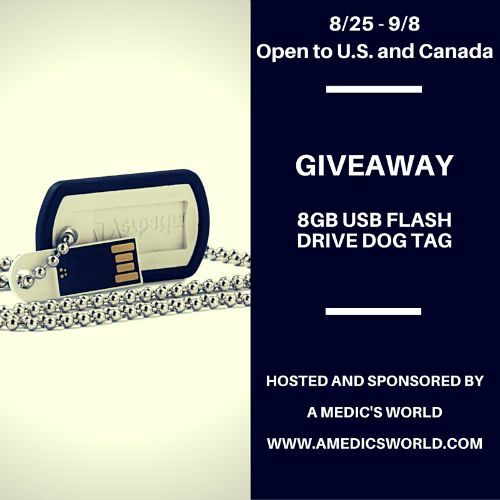 Thanks for stopping by today to enter this giveaway for the USB Flash Drive Dog Tag. Being a Veteran myself, I just wanted to take time and thank all the wonderful men and women who are currently serving, or who have served their country in the past. Maybe you are a soldier, or have a soldier in your family that would adore this, or you just want it for yourself because it looks cool. No matter the reason, good luck, and thanks for being here to enter this giveaway today. 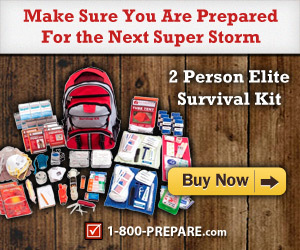 Sweepstakes starts 8/25 at 8 am EST and ends 9/8 at 11:59 PM EST. Winner will have 24 hours to respond before a new winner is chosen. A Medic’s World is responsible for prize fulfillment. Can’t wait to win one? Buy it here on Amazon today! A Medic’s World was not compensated for this post, nor is responsible for prize delivery. Thanks for stopping by A Medic’s World, and good luck. If you would like to see your brand or product featured like this contact Tom at medictom@amedicsworld.com today, and let’s see what I can do for you! I thank all the military and God for them being there and what they do for the country. I fully support and give the all military, veterans, those who’ve lost their lives defending our great country by doing those jobs you and me would never want to do in order to keep this place the safe and beautiful world we know. Thank for being brave, courage, men. women, and dogs. For putting your lives at risk for ours. Thank you to all the veterans past and present who have sacrificed their lives for us. Words fail. We Fail. We owe you so much more: more support ~ more gratitude. Just as you were there for us ~ we must be there for you. Thank you. Thank you for your enormous sacrifice, courage and service. Thanks to all the veterans both past npresent and for those who gave all. Thanks to you and to everyone who has served in the military! Thamks for your service to all vets past and present. Thank you to all the veterans who have sacrificed their lives for us. To all our servicemen and women, to all our veterans, to all those who sacrificed their health and even lives for all of us – thank you, always. Hug a vet today! SUPPORT OUR TROOPS AND VETS! Thanks to all veterans past and present and especially those who gave all. Thanks, Military members! You’re simply awesome! Thanks to all our current military personnel, our vets, and those who will serve. Our very lives depend on them! Kiss a vet today! SUPPORT OUR TROOPS AND VETS! Thanks to those currently serving, those who have seerved and those who gave theiir alll. Being a bit older, I knew many who didnt make it back from, Vietnam and those who did come home were never the same men (or women) I myself was born in Great Lakes- a product of two Korean War vets. My Mom was Army, Dad was Navy. Bless those who have gone before. I’m just here for the dog tag. I won’t leave a forced meaningless thanks. But thanks Tom for this awesome page and give away. Thanks for your sacrifices for all of us here. Thank you also to your families who also sacrifice. My sincere thanks to all those that have served this country, and to their families that supported them. It was my Honor serving the greatest country in the world along side my fellow brothers and sisters in all the branches of the military, god bless you all. I am so very very grateful to all those who have and are serving in the Armed Forces. There service and sacrifice does not go unnoticed or unappreciated. I’d like to THANK ALL THE US MILITARY for continuing to KEEP AMERICA SAFE! Thank you for your service, Veterans. I am so grateful for the freedom and safety you provide our country. A HUGE thanks to all of those who have served our country, and those who are currently serving! Our military and former military are simply AWESOME! Thank you to all the veteran’s that are currently serving and those that have served. A special thanks for all veterans who made the ultimate sacrifice. Also, thank you Tom for your service. A big Thank You to both the service members & their families. You sacrifice so much, and receive so little in return. Please know that you are appreciated beyond words. To all those who have risked their lives for us, are doing so now, and will in the futuew – thank you. There is no way to repay you. God Bless our troops and vets! Very nicely said Sandy, thanks for the comment, and have a great day! Thank you to all the Veterans who served our country. I would like to thank the military who died fighting for our country and veterans and also the all men and women currently serving in the armed forces today. I absolutely appreciate the sacrifices that they made and are making,my dad was a World War II veteran and I can’t thank you enough. This Veteran thanks all that served in the military for our country. SemperFi. Thank you so much Sandy! And I salute the service of your Father as well! Thank you….on behalf of my dear father…he was so proud to serve!